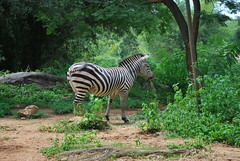 Bannerghata National park is a rich zoological reserve on the outskirts of Bangalore city. It hosts a variety of animals from Tigers to Peacocks. It also has a Zoo and a Butterfly park. The zoo has a rich variety of reptiles and birds. The zoo remains closed on all Tuesdays. The Butterfly park is a recent innovation which hosts about 20 different species of butterflies. This park gives many information regarding butterflies. This park has artificially maintained climate. Any time other than rains is apt for seeing the park. September to May is the best time. There are only a few hotels near by. You can find many small shops selling snacks at the entrance of the park. While you enter the zoo you will have to give all the plastic food covers you carry and get them replaced with paper covers. Bannerghata National Park is 20km from Bangalore. Route 1: Bangalore - Diary Circle Flyover - Hulimavu - Bannerghata - Bannerghata NP. BMTC runs Volvo bus V365 from Kempagowda bus station to the park. Private vehicles are not allowed to enter the park. Forest department provides vehicles for safari inside the park.